I am really going to do a better job this year of keeping my blog and personal receipts separate. I think this handy little receipt wallet will do the the trick! — personal receipts on one side, business receipts on the other. Really it could have many uses — coupons, lists, checkbook cover, etc! 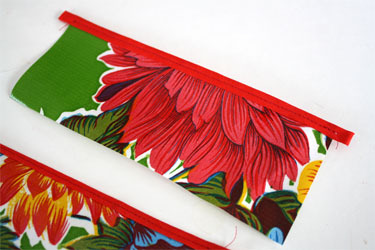 The oilcloth receipt wallet went together quickly and I was able to use up some scraps. Slip bias tape around the 6 1/2 inch side of the 2″ wide piece and stitch. It can hang off the edge, it will be trimmed when finished. Note: I get my oilcloth from Oilcloth Addict! Be sure to check out her personal blog, ModernJune, for some fabulous oilcloth tutorials and great tips for sewing with oilcloth. Unfortunately http://www.etsy.com/shop/oilclothaddict shut down, for all practical purposes, on June 11, 2016. That is the date of the last post which included the following text: "After 8 great years Oilcloth Addict is closing it's doors." Dang, it is getting harder and harder to find a place with what I call "real" oilcloth which is of the quality of the material I bought in the 1980's. Thanks for sharing where you get your awesome oilcloth prints from! The stores never have a great selection, so it is nice to have a trusty source online! You don't really need to use purchased oilcloth though! 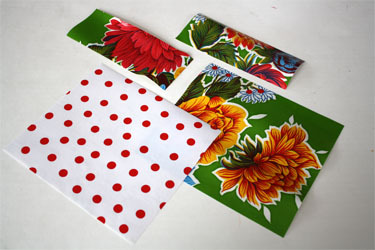 There is an alternative, you can make your own waterproof (oilcloth) fabric out of any cotton print. There is a product made by Heat n' Bond called flexible vinyl - it's an iron on! Various fabric stores carry it, it only comes in 17" width by how ever many yards you would like but it's so much fun to make fabrics waterproof for so many projects! Awesome! Ur blog really rocks! Great little project - I love it! I'll be linking today! This is such a great idea! I'm a complete coupon mess, and this will be a huge help! Thank you! That is so cute! 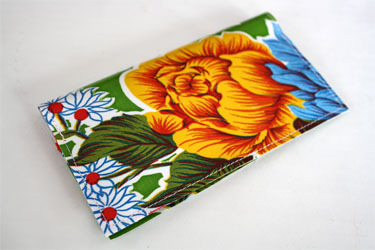 I made a similar wallet for myself and for gifts last Christmas and now I love taking my checkbook out of my purse and "showing it off" to the lucky people at the checkouts. 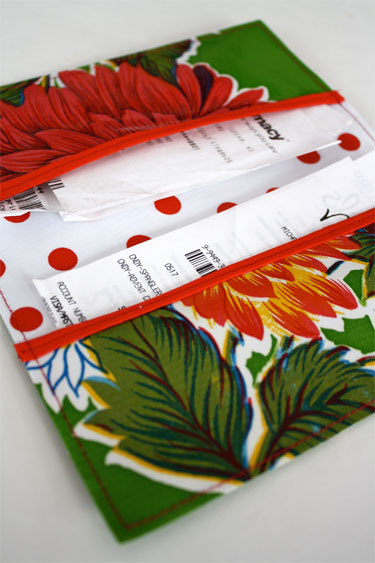 :P Oilcloth is a great idea, too, b/c receipts will just slide right in! my word. the simplest of things and it makes THE most sense! instead of my wallet always being so filled. hmmm i might add a snap for closure. for some reason i always need a rubber band to close my wallet, it's always on full. Love it! And love this blog...it is the only one I follow these days. Thanks for the great ideas. This is so lovely! You are inpsiring me to try making something out of oilcoth - and thanks for the link of a supplier. I followed your tutorial for the reversible tote bag last night and I am so pleased with the results!!!!! Made it as a present from my friends birthday, hope she likes it (I want to keep it for myself!). This is awesome. Thanks for the tutorial. I'd like to make something similar for the envelope system. My purse destroys paper envelopes, and this would be perfect. great tutorial! thank you! I have some extra oilcloth in my stash - I'll have to try one! Oh, this is so cute, and even I could make it without tears of frustration! My husband got me a teflon foot recently; I think he's encouraging me to fire up the sewing machine again. Is oilcloth difficult to come by? What about Joann Fabrics? Thanks for the Oilcloth Addict link. I think I'll stop by. Super cute! I need to be better about this also. Thanks so much, I'll be linking. Hope you don't mind, but I thought this was the cutest thing ever! I blog about coupons and deals and had to blog about this link as well!!! Love it!!! Have I mentioned that you are my favorite blogspot to check out??? Thanks for all of the crafty inspiration!!!!!!!!!! I blooged about this. It is too cute!!! What is oil cloth? Besides how cute the scrap you used is, what is its main purpose?? Hey I may need one of those as well!! This looks so cute, and simple, I think even I can do it!!! Thanks! great easy to follow pattern...and great reminder to keep life in order! I want one! 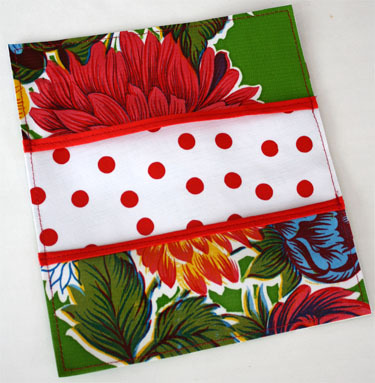 ;-) Love this idea -- very useful and the oil cloth is darling!